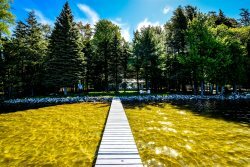 Quiet and Secluded Vacation Home near Sleeping Bear and Much More! While few guests or property owners have the need to stop by our office, sometimes it's nice to just say "Hello!" Since our operation has the ability to be pretty mobile, we have a tendency to take the office to the park on a gorgeous summer day! Before going out of your way, let us know you're planning to stop, we might just invite you to come sit with us over an ice cream cone! Roughly 10 miles north of the US-31/M-55 intersection is the intersection of US-31 and 8 Mile Rd. On the northeast (far right) corner of the intersection is the Alpine Motor Lodge. Our office is to the right side of their lobby. Take US-31 South toward Bear Lake. About 5 miles south of Bear Lake, the Alpine Motor Lodge will be on your left side. Our office is to the right side of their lobby. Take M-22 South toward Onekama. Toward the south side of Onekama, M-22 makes a sharp right turn. Just after that turn, take 8 Mile Rd, it only goes to the left. A couple miles and you'll come to a stop sign, US-31. On the northeast (far left) corner of the intersection is the Alpine Motor Lodge. Our office is to the right side of their lobby.